Human Rights in Ukraine – 2009–2010. Report by Human Rights Organisations / Editor Y. Zakharov / Ukrainian Helsinki Human Rights Union; Kharkiv Human Rights Protection Group. – Kharkiv: Prava Ludyny, 2011. 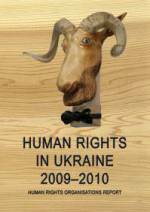 – 444 p.
This book considers the human rights situation in Ukraine during 2009–2010. It is based on studies by various non-governmental human rights organizations and specialists in this area. The first part gives a general assessment of state policy with regard to human rights in this period, while in the second part each unit concentrates on identifying and analysing violations of specific rights in, as well as discussing any positive moves which were made in protecting the given rights. Current legislation which encourages infringements of rights and freedoms is also analyzed, together with draft laws which could change the situation. The conclusions of the research contain recommendations for eliminating the violations of human rights and fundamental freedoms and improving the overall situation.